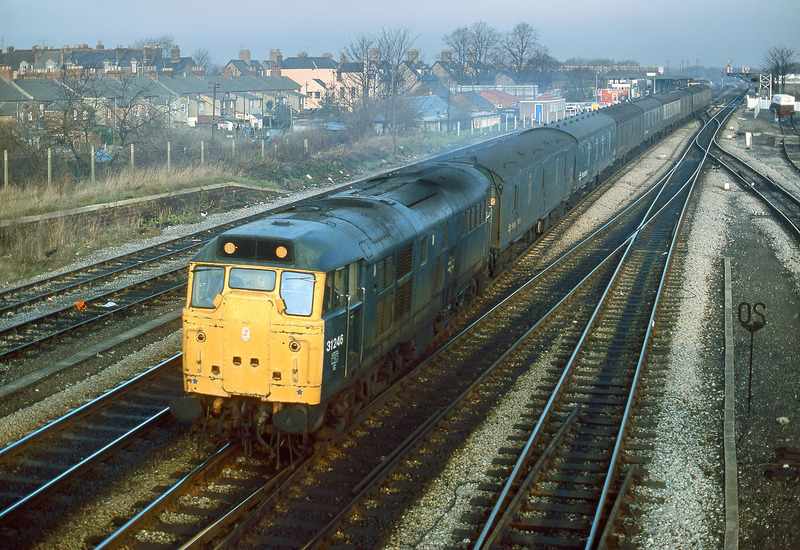 31246 leaves a dull and slightly misty Oxford on 1 December 1983 with the 3V19 04:50 Banbury to Old Oak Common empty newspaper vans. If you are wondering how it is possible to have a daylight picture of a train with this early a departure from Banbury in nearly midwinter, it is simply explained by the train's booked layover time at Oxford from 05:22 to 09:35. It is here leaving the customary five minutes early, after having had more than ample time to attach the required vans in Oxford's bay platform. The loco is long gone, and so is the carriage of newspapers by rail.